South of Orlando, between the beach side communities on the east and west coast, you’ll find huge open tracts of land. 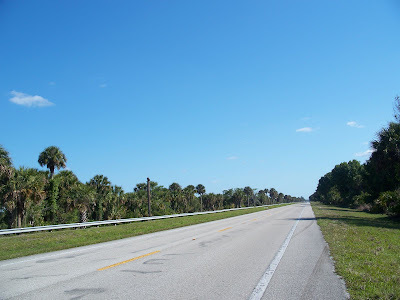 Prairies, Lake Okeechobee, the Everglades with small towns and farms scattered throughout. This is the agricultural heart of Florida. Citrus groves spreading as far as the eye can see, and sprawling cattle ranches. Roads where you can pleasantly lose yourself for as long as you’d like. Even by the wilderness standards of the region, SR 29 is sparse. The biggest city on it is LaBelle, the Hendry County seat. I would’ve thought it was Clewiston. 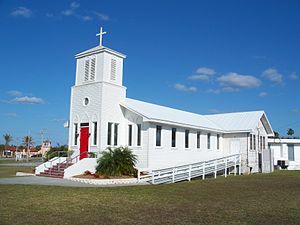 Both are at the northern border of the county, Clewiston on the east side, LaBelle the west. Actually, they’re pretty much the only two urbanized places in the county. 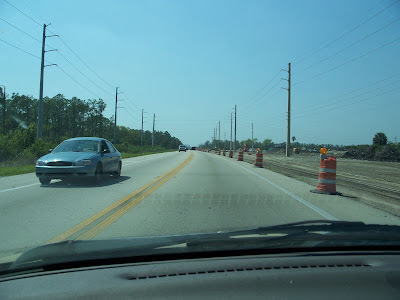 From Clewiston, there are two main ways to get to LaBelle. One is SR 80, which splits off from US 27 and takes you right into LaBelle. But I’m going to start the other way, from Moore Haven. Going west from there, take a left at the SR 78 intersection. No more dike, as you’re heading away from Lake Okeechobee. After about 8 miles, you’ll see a cemetery on the right. This is the Ortona Cemetery. There aren’t any signs I could see indicating you’re in Ortona, but that happens sometimes. The cemetery is the burial site of Billy Bowlegs, a historical figure of some note, apparently. You can drive around in the cemetery, or park and walk some. It’s a rather large cemetery, so you could easily spend an hour or more exploring. About 6 miles on, and you’ll reach SR 29. Going south, you’ll only see fields and large stands of trees. In a couple of miles you’ll see buildings here and there. Another mile or so, you’ll cross a bridge over the Caloosahatchee River. Welcome to LaBelle. In fact, you’re in the historic district. Park in the park next to the river, or somewhere off the street. This is one of the smallest historic districts in the state, only a block long. Go a bit further down, and grab a bite at the restaurant in the old Forrey Building. Pretty good food, as I recall. Other highlights include the original home of the county’s namesake, and one of the more unusual-looking courthouses in the state. I can honestly say I’ve not seen another like it. I don’t mean that in a bad way; I think it’s got a quirky charm. There’s also a heritage museum a block down from it, if you want to find out more of the area’s history. And a Wendy’s nearby, if you’re hot from all the walking and need a cold drink or a Frosty to chill out. Head east 5 miles on SR 78 or Fort Denaud Road and you’ll reach the site of, well, Fort Denaud. There’s an old bridge that crosses the Okeechobee Waterway. There’s a historical marker about the area on the north side of the bridge, and a smidge further north is the old Fort Denaud Cemetery. By the way, SR 29 is a very straight road. It does have some bends, but they’re few and spaced out. So beware of highway hypnosis. Over 20 miles from LaBelle, and you’re in Immokalee. And in Collier County. The one NRHP site is the Roberts Ranch, which looks to be part of a living history sort of museum. It covers a large area. The hours are limited, so check to see when they’re open if you want to see it all. If you’re low on gas, or need to avail yourself of facilities, do it now. 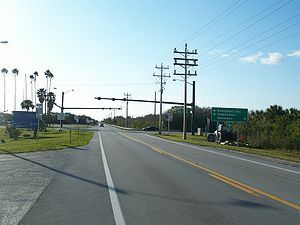 It’s around 35 miles until the next outpost of civilization, at the US 41/Tamiami Trail intersection. You’re skirting the edges of the Everglades now. The Big Cypress National Preserve is on your left the rest of the way. In a while, you’ll see high fences on either side of the road. That’s because you’re going through part of the Florida Panther National Wildlife Refuge. 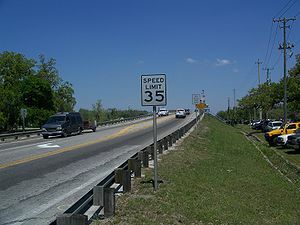 It’s also one of the rare roads in Florida that has a day vs. night speed limit. To reduce your chances of hitting a panther crossing the road, I suppose. Twenty miles from Immokalee, and you’re at I-75. The road goes over the interstate, and you can actually get on it here. If you want to get to Naples or Miami quick, this is the place. About 17 miles on from the interstate, you’ll reach the Tamiami Trail. Not travelled much nowadays, with I-75 to the north providing a faster route between coasts. But the trail was a tremendous accomplishment for its time, and still in use today. There’s a visitor center here for the Preserve, and a small convenience store across the street. Get some info and stretch your legs, why doncha. Technically this is the end of SR 29. But we’re going to continue on a little further down to the original end, which is now CR 29. Oddly, after only visiting there for a couple of hours, this is now one of my top ten spots in the states. Just 4 miles down, and you’ll be in Everglades, a/k/a Everglades City. In the early days of Collier County, this was the county seat. Which seems weird now, since it’s currently Naples. But back at the county’s founding, there wasn’t much of Naples. Everglades City was going to be the boomtown, after the Tamiami Trail was finished. It was for a while, but then development and travel shifted away from the area. Now, Everglades is a quiet town tucked away in the southwest part of the state. But it’s not rundown, as so many Florida towns that have survived from bygone days are. It’s very bright and clean and casual. Probably popular with boaters and fisherman and folks wanting to escape the big city. Maybe that’s why I like it so much. Another 4 miles south is Chokoloskee, on Chokoloskee Island, which is a shell midden. Consult the map linked below, since it’s tricky to get to the next place. I almost missed it when I was there. You wouldn’t think you could get lost in such a small town, but the roads are very twisty and everything’s close together. Very Castrovalva. Once you get to the end of Mamie Street, you’ll find the last NRHP on this trip, the Ted Smallwood Store. Another survivor of many decades. More amazing because it’s all made of wood, and must have been hit by dozens of hurricanes since it was built. A testament to old fashioned craftsmanship. There you are, really rural Florida. Until next time, see you on the road!